It all started with this vintage Strawberry Shortcake DVD. There was talk a one point of a mermaid or Lalaloopsy party (both excellent ideas!) 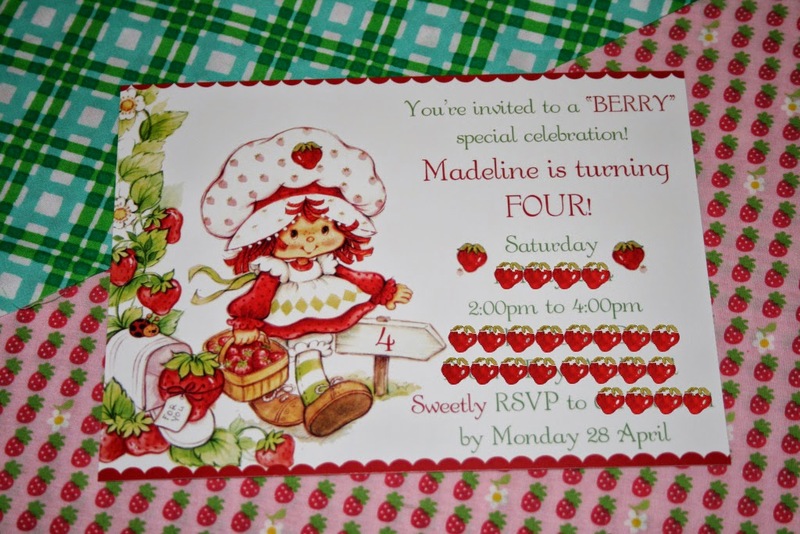 but once she watched the original Strawberry Shortcake cartoon (declaring it much better than the modern one) her mind was made up - the theme was to be vintage Strawberry Shortcake for Madeline's 4th birthday. Her vintage loving Mumma was thrilled! The first thing I always do is choose the invitations and the build the party around it's design. 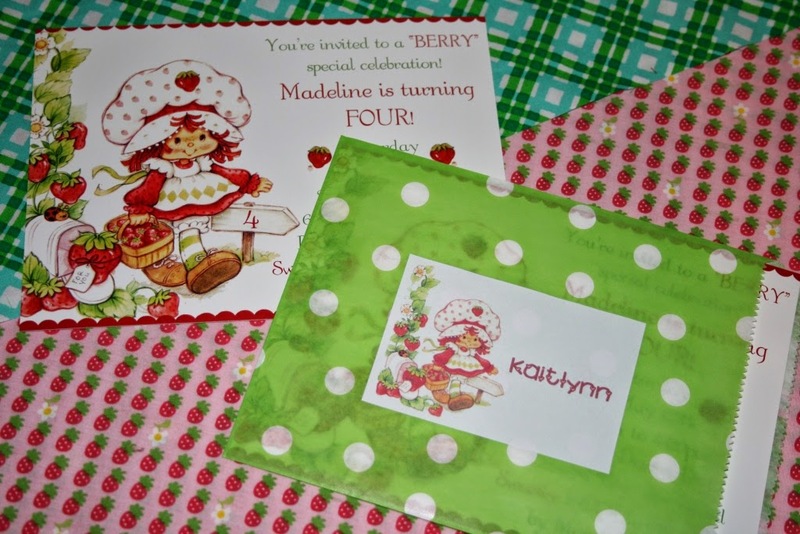 These gorgeous invitations were designed by Itsy Bitsy Invitations on Etsy. 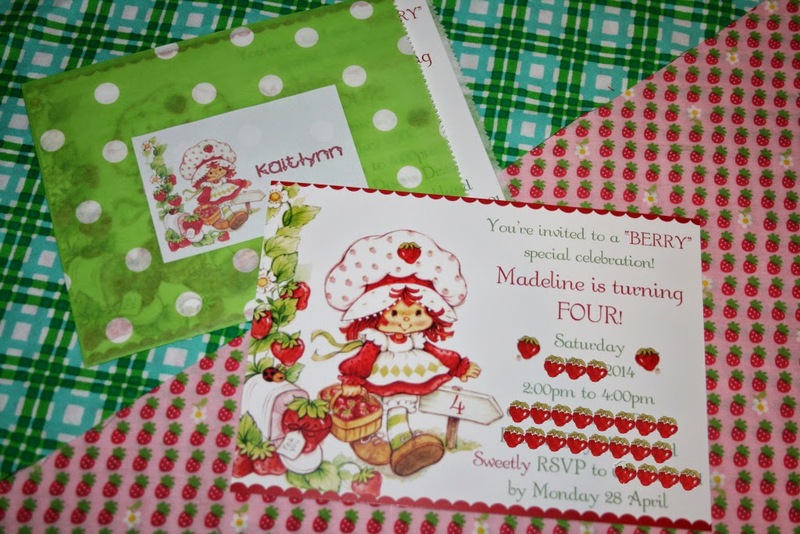 I had them printed by printing.com and popped each invite in to a polka dot paper bag from our local $2 Store. I made and printed the name labels myself. We hosted the party at home this year. I was a little nervous at the thought of 12 (it was supposed to be 6 but Madeline kept inviting people!) kindergarteners in our house but I can honestly say that they were all absolutely lovely and it was the least stressful party I've ever hosted. I made the birthday cake which was based on vintage Strawberry Shortcakes house. It's my favourite cake I've made yet. The whitewash wooden crates, which I used as table risers, are from Miss Mouse Boutique. Cake Pops - The polka dot paper straws are from Look Sharp Store. The flower cupcake cases were from New World at Easter. The doilies are from our local $2 Store. My Mum made all of the tiny icing flowers which you'll see pop up through out the table. I got the pink cake stands on special from The Warehouse for $4.98. Bargain! Cupcakes - The cupcake cups are from Pop Roc Parties. I think these are my new favourite thing to bake in! I made the fondant strawberry toppers by following a simple tutorial from Juniper Cakery. And Iced Cookies. I used the Best Sugar Cookie Recipe from In Katrina's Kitchen which is really quick and easy. The dough doesn't require chilling before rolling out or baking and the cookies hold their shape perfectly. I had wanted to ice strawberry shaped cookies but completely ran out of time so pink circles with sprinkles it was. We also had apothecary jars filled with red, pink and white jellybeans which I got from Hey Hay Candy. All of the ribbons were from Ikes Emporium. I found these fabulous bowls at our local $2 Store which I filled with chippies plus we also served mini hot dogs. The stripe tablecloth was a length of fabric from the quilting section at Spotlight. I bought these sweet Meri Meri Toot Sweet paper plates from Pop Roc Parties for the kids to eat their afternoon tea. I just love the stripes and scalloped edging. The polka dot napkins were from Look Sharp Store. Each child had their own personalised water bottles too. I purchased the mini water bottles in bulk boxes from Countdown and designed and printed bottle labels myself. I made each of the kids a party hat to wear on arrival. Plus, there was a special hat for the birthday girl. For decoration (and not to waste any precious fabric) I made a rag banner out of the scraps I had left over from making the party hats. For party favours, as well as the party hats, each little girl was given a pink polka dot paper bag which I got from the $2 Store and picked out a Strawberry Shortcake charm bracelet (not vintage unfortunately) from NZ Party Themes, a pink candy stick from Hey Hay Candy and a handful of jellybeans from the apothecary jars on the main table. Our one boy party guest got a blue paper bag with some Disney Cars treats in it. We had a few vintage decorations dotted around the table too. I made this yarn wreath. And printed this image from the internet. The mini bunting was from Valentines day. The old Strawberry Shortcake book, Strawberry Shortcake and Custard dolls and Mr Longface toy were my sisters when we were little. 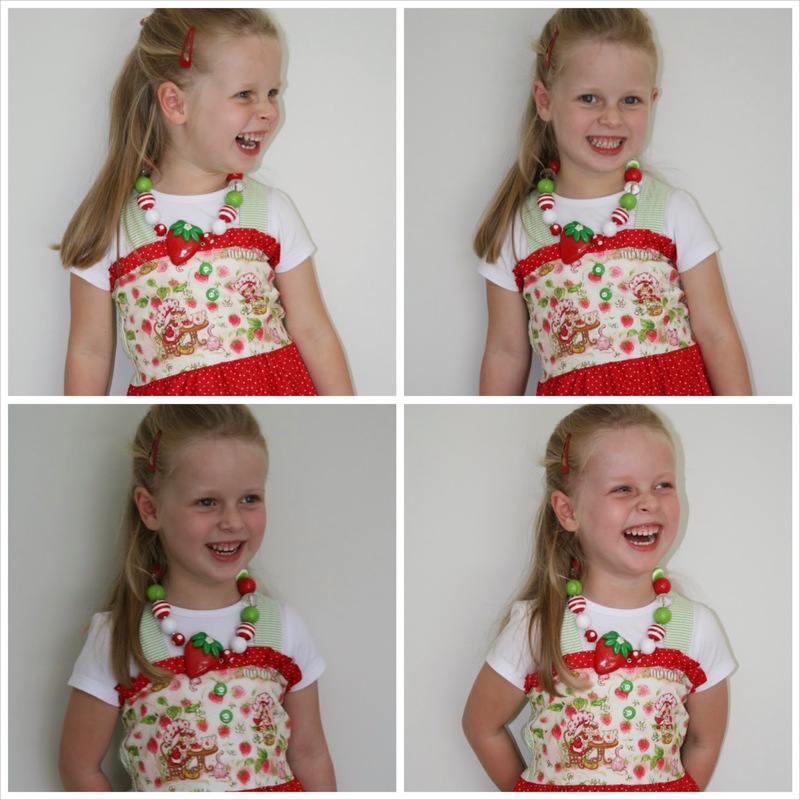 Maddie wore the sweetest vintage print Strawberry Shortcake dress from The Princess in Pigtails Designs. We already had the strawberry necklace which was made by Daizy Bugz. We kept the party games really simple and to a minimum. We played pass the parcel and had a piñata. The kids all had heaps of fun playing outside in our wendy house or in the playroom with our girls toys. It was lovely to see 12 kindergarteners entertain themselves so well. 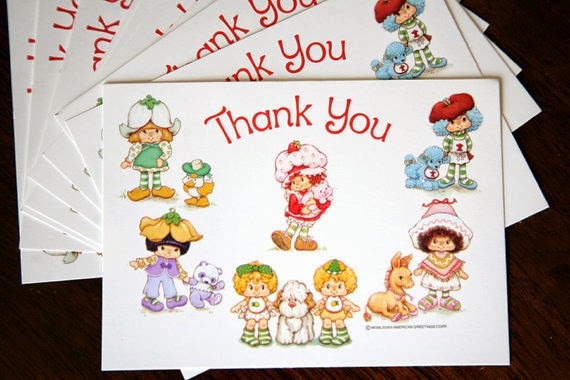 Finally, we have just sent out all the thank you cards to everyone who came and made Madeline's day so "berry" special. I was lucky to find these original cards on Etsy. So cute! Most importantly, this gorgeous girl said she had the best day ever! She loved her party. what a beautiful party, love all your creative ideas! those pom pom hats are so cute :) and I LOVE the strawberry plates, can just imagine how stoked you would have been to find them, I love it when I find something perfect in a random place!! This is amazing! So much detail, I absolutely love it. I also have that same Strawberry Shortcake doll (and Custard) - go the 80's!